“Ferry, get us some help”. That is what I told Danny Ferry whenÂ accidentally ran into himÂ whenÂ I was walking out of the arena last night. 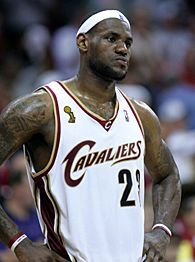 He didn’t look happy at all as well as 20,000+ fans that were starving for a win in their first NBA Finals. The Cavs died hard,Â they tried to earn someÂ respect by preventing the Spurs from celebrating on the floor at Quicken Loans Arena. But the Spurs are just too good. Lebron James did the same thing, “I didn’t want to turn around and look at (the celebration),” he said. That is exactly what Danny Ferry need to do during this off season.